Texas Gov. 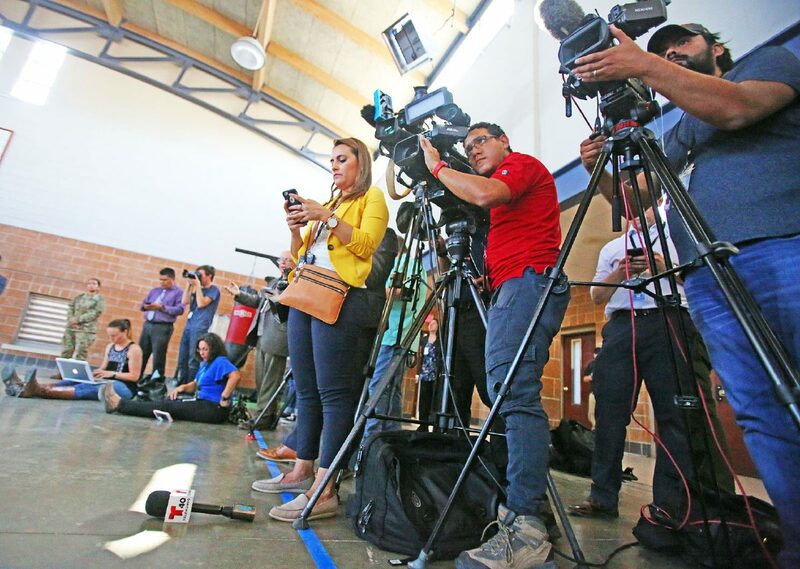 Greg Abbott speaks to the press as he visits the Texas National Guard Armory on Thursday, April 12, 2018, in Weslaco. Abbott announced that there will be an increase of 1,000 Texas National Guard on the southern border with Mexico. WESLACO — Gov. Greg Abbott met with Texas National Guard troops here Thursday afternoon, a week after President Donald Trump urged their presence on the U.S.-Mexico border. 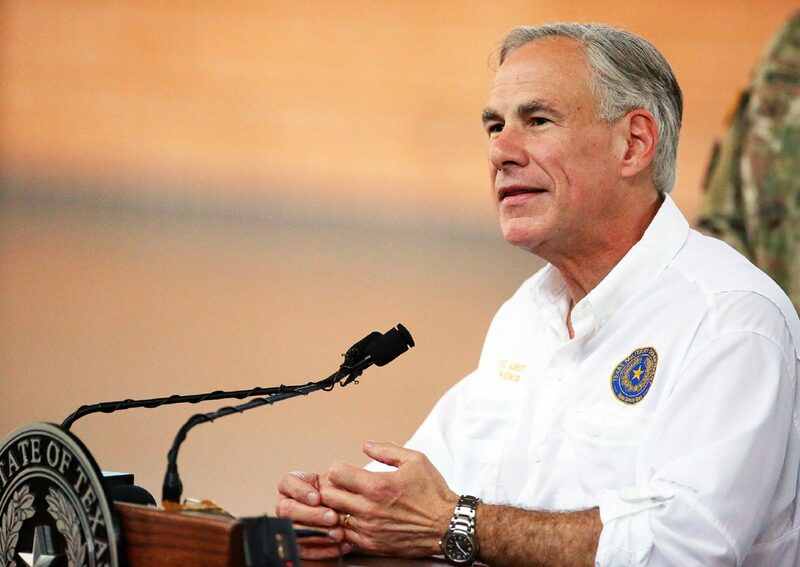 Abbott made his way to the Rio Grande Valley days after the president characterized the border as “in crisis” — spurred in part by news of a caravan of Hondurans making its way from Central America to the United States. Before addressing the media inside the Tomas Garces gymnasium at the National Guard’s facilities in Weslaco, Abbott met with U.S. Border Patrol officials, including RGV Sector Chief Manuel Padilla, where he was briefed on their operations. Abbott, who sat in front about more than 100 guardsmen while speaking to the media, said that as of Thursday there were more than 762 troops on the U.S.-Mexico border — which will grow by 300 guardsmen per week until they are staffed at 1,400 total. Gov. Greg Abbott, left, talks with leaders of the Texas National Guard and the U.S. Border Patrol at the Texas National Guard Armory on Thursday, April 12, 2018, in Weslaco. Abbott announced that there will be an increase of 1,000 Texas National Guard troops on the southern border with Mexico. Protesters chant as Texas Gov. 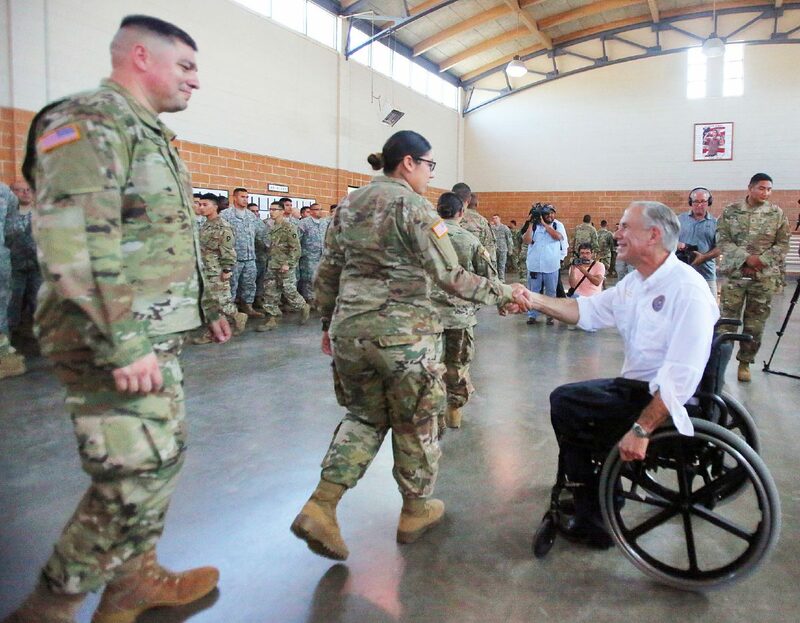 Greg Abbott visits the Texas National Guard Armory on Thursday, April 12, 2018, in Weslaco. Abbott announced that there will be an increase of 1,000 Texas National Guard troops on the southern border with Mexico. Protesters chant as Texas Gov. Greg Abbott visits the Texas National Guard Armory on Thursday, April 12, 2018, in Weslaco. Governor Abbott announced that there will be an increase of 1,000 Texas National Guard troops on the southern border with Mexico. Texas Gov. Greg Abbott, right, thanks Texas National Guard members as he visits the Texas National Guard Armory on Thursday, April 12, 2018, in Weslaco. 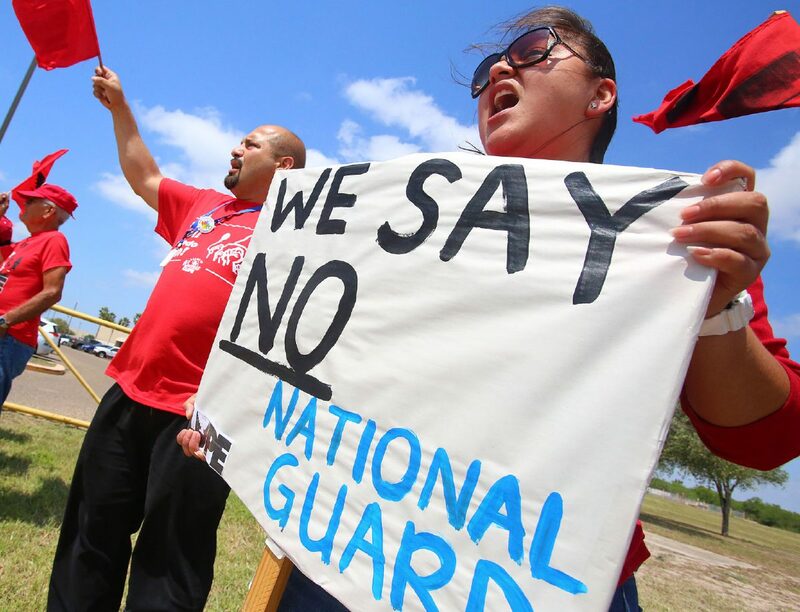 Abbott announced that there will be an increase of 1,000 Texas National Guard on the southern border with Mexico. Texas Gov. Greg Abbott talks with the press as he visits the Texas National Guard Armory on Thursday, April 12, 2018, in Weslaco. Abbott announced that there will be an increase of 1,000 Texas National Guard on the southern border with Mexico. Television cameras record as members of the press cover Texas Gov. 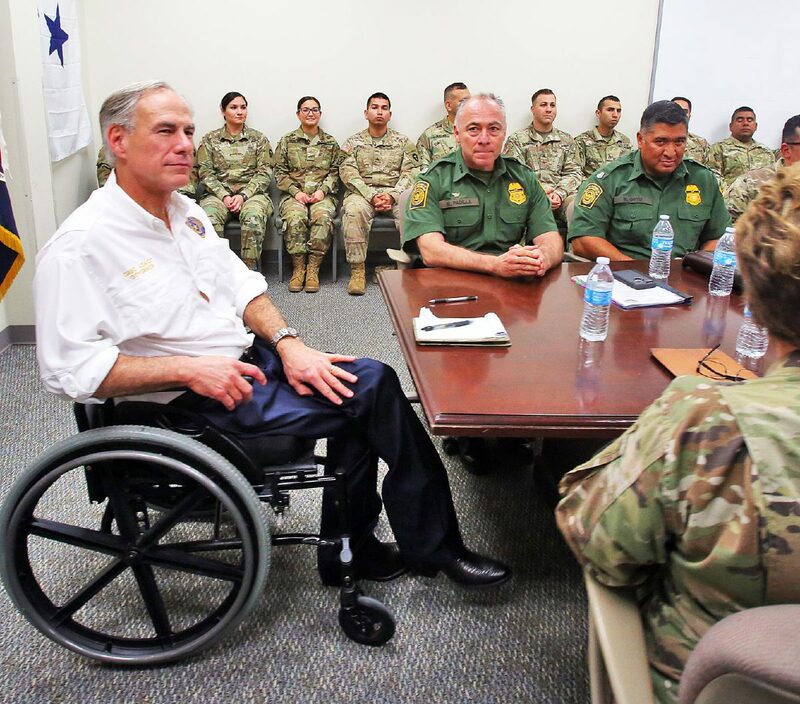 Greg Abbott's visit to the Texas National Guard Armory on Thursday, April 12, 2018, in Weslaco. Abbott announced that there will be an increase of 1,000 Texas National Guard on the southern border with Mexico. Last week Defense Secretary James Mattis approved paying for up to 4,000 National Guard personnel from the Pentagon budget through the end of September. A Defense Department memo states the National Guard personnel will not perform law enforcement functions or “interact with migrants or other persons detained” without Mattis’s approval. It read, “Arming will be limited to circumstances that might require self-defense,” but did not explain further. Including the troops sent to New Mexico’s border with Mexico, 1,600 troops at three border states — which include Texas — will support Border Patrol and other federal agencies already working those areas. In California, however, not all of the 400 troops Gov. Jerry Brown agreed to deploy on Wednesday will be on the border. 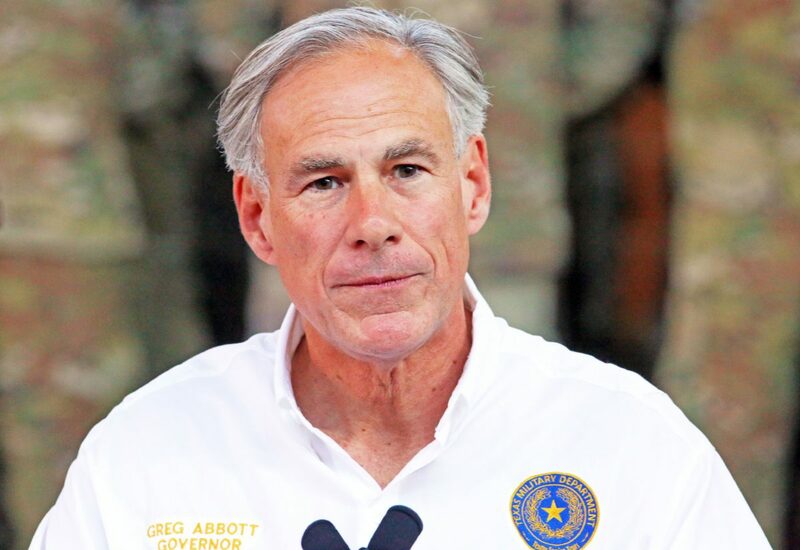 Abbott also described the troops’ moral as “very high,” and that he was told that there are Texas National Guard members who are calling National Guard officials and offering their services to help along the border. The move to send troops to the U.S.-Mexico border was precipitated by Trump’s displeasure with a spending bill that he at one point threatened to veto, but ultimately signed. In that bill, Trump got $1.6 billion toward border barriers, significantly less than the amount needed to secure the 700 miles of wall on the southern border he’s touted — a cornerstone promise of his presidential campaign. Not only will there be further support for enforcement on the border but also potentially tougher prosecution in federal courtrooms in relation to immigration cases. In a memo sent by U.S. Attorney General Jeff Sessions Friday to federal prosecutors in each U.S. Attorney’s Office along the southwest border, to include the southern districts of California and Texas, in addition to the districts of Arizona and New Mexico as well as the western district of Texas, Sessions urged a zero-tolerance policy with regard to illegal entry and re-entry cases. The southern district of Texas, among the areas the memo was sent, includes federal offices in McAllen, Brownsville, Corpus Christi and Houston. Sessions cited the Department of Homeland Security report about spiking illegal border crossings in March, showing a 203 percent increase in illegal crossings from March 2017 and March 2018. Another report shows a 37 percent increase of the same infraction from February to March of this year. The governor cited the same statistic during his visit, saying that the increase was concerning and the main reason for the deployment of troops — not the caravan making its way to the U.S.
On Wednesday, Sessions was in Las Cruces, New Mexico where he spoke at an annual meeting of the Texas Border Sheriff’s Coalition. The coalition is made up of 31 different sheriff’s departments from Arizona, New Mexico, California and Texas. Sessions said the lack of a barrier on the border opens the country to illegal immigration. His trip coincided with the beginning of new border wall construction, of about 20 miles, in Santa Teresa, New Mexico. Abbott focused on the reason for the troop deployment, stating it was necessary to have the men on the southern border to stop “escalating cross-border activity” and to prevent MS-13 gang members from getting past the border and into the U.S.
“The MS-13 (gang members) are not stopping at the border,” Abbott said. Abbott confirmed the limited supplemental role the troops are tasked with, saying that they would not be apprehending migrants but rather working in a surveillance capacity. 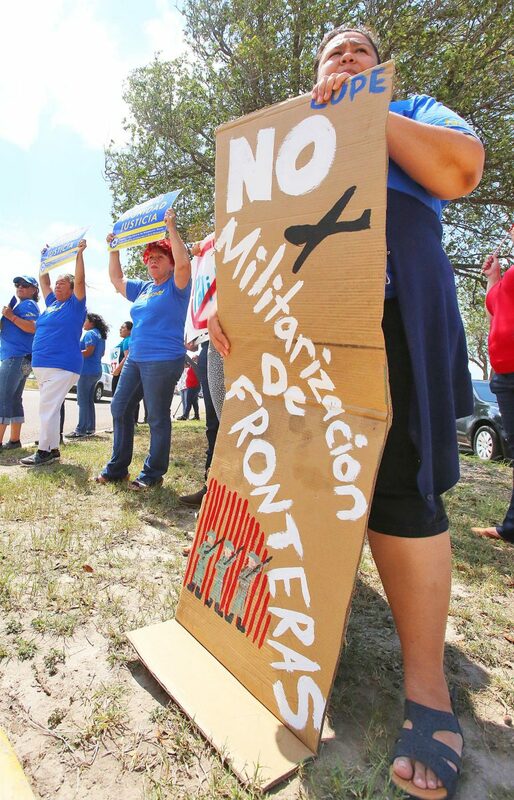 Last week, officials with the Texas Military Department confirmed the troops deployment to the Valley, clarifying they would serve in a support role for Border Patrol and Customs and Border Protection officials. During the “initial phase,” the guardsmen will be tasked with — among other things — “command and control, coordination cells and operational planning as requested in support of the federal entities already on the border,” Texas military officials said. “We want to shut down the gangs and smugglers,” Abbott said, before posing for photos with the troops.